This week we are talking about marriage again. This time, we are focused on “softening your heart” inside of marriage. What does that mean? Do you find yourself “hardening your heart” inside of marriage? What does that mean and how does it affect your relationship? First, we discuss the idea of receptivity. Woman are uniquely gifted in being receptive inside of relationships. But do we sometimes reject this gift or deny it? Out of pride or defensiveness, do we sometimes close ourselves off in ways that hurt our marriage? I recommend Pat Gohn’s excellent book, Blessed, Beautiful, and Bodacious. Next we talk about our habits. What kinds of habits do you have in communication with your spouse? Are they good or bad? Helpful or hurtful? We discuss ways to improve our daily habits to bless our marriages. Finally, we talk about the idea of having a “Tabor Vision” of your husband. Do you see your man as God sees him or do you define him by his flaws? This concept comes from Alice Von Hildebrand in By Love Refined: Letters to a Young Bride. This week I share a fun conversation I had with Bonnie Engstrom, blogger at A Knotted Life and co-host of The Visitation Project. Bonnie shares the amazing story of her son’s miraculous healing at birth and how his story is part of the official cause for the canonization of Venerable Fulton Sheen. She is a beautiful and enthusiastic woman of many talents and you will love getting to know her. 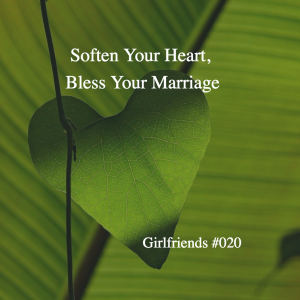 This week’s challenge is to examine your approach to your marriage in light of “softening your heart” as we talked about. Pick one area where you can improve, and make that change! I share feedback from listeners David and Pam who left kind reviews on iTunes. You can leave a review too! Thanks so much for your support! And thank you, as always, for being here. Your encouragement and support of Girlfriends means so much and I am so grateful for your presence here. God bless your week! I heard of your podcast on one of the sonrise morning shows on EWTN radio. I have tried to listen to all of your podcasts as you release them on my morning walks. I thank you for the encouragement, words of wisdom and the reality you bring to marriage and raising children. You are a source of blessing. I was really struck by this week’s podcast because it resonates to me at this time in my marriage. I have been married 9 years and it has been up and down. We have been at very high points but we are in a low at this time. My husband has gone cold but there has also been alot happening in his life. He lost a sister, who was like his mum, there are financial struggles and his mum is aging and he is the main support for her. On friday we had a big brawl and in the heat, he stated that he has no love for my mum and that my mother will never be anything to him. My heart was torn in pieces, I wept for hours. But when I asked him what is this issue? he says that my mum never appreciated him and that my mum thinks her sons are better than him. So he believes my mum doesn’t like that fact that we are married. We had this issue last year and I did an intervention and my mum said look you are my son and lets forget all that happened. But apparently that did not help. My husband is someone that always believes he is always right in any discussion its difficult to make him see reason. So I have tried talking to him but there is no impact. Pls can you give me tips on what I can do? I am currently praying and I have resigned talking to him on this issue. We do talk on other things. Our marriage has gone dry, sometimes I think he is just in it for the kids which is also how I feel sometimes. Pls help me with what I can do. Can you send me an email and keep my story anonymous? My heart goes out to you! I would like to reply privately as you suggest, but WordPress does not give me your email address. Can you send me an email at danielle@daniellebean.com?